To hear some pundits say it, the thought of offering a chance to change BC's voting system is to be the end of human civilization as we know it. What they're doing is misleading people, and it's very dangerous. I just read in the linked article that the fear is that if only 50% bother to vote, potentially 25% +1 will decide the outcome of our system. This is apparently an outrage. But by the same math, should 40% vote for one party in the current FPTP system, they stand to get 100% of the power. If you're still counting, 40% of the 50% turnout is 20% of all voters. Is 25 > 20? Asking for a friend. A more ludicrous assertion was that proportion representation will prop up extremist groups. This is disproven right here in Canada. In 1993 and every election until 2011, the regional support concentration in Quebec meant that one party with an anti-Canada mandate would win 40-60 seats despite 7% nationwide support. Did I mention that this regional party didn't even have candidates outside Quebec? Same thing for the western based Reform Party. Their support was concentrated in the west where they'd regularly get 50-60 seats, but no better than 18% nationwide. Both of these extremist parties profited from FPTP. Both would have been rendered irrelevant under PR. 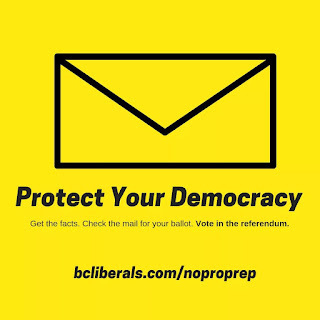 What isn't being mentioned in the linked article, and will never be admitted by the BC Liberals is that the NDP/Greens aren't changing the system; they're going to offer a referendum to choose a new system. Or not. And the option hasn't been decided yet. But if you're a publication looking for headlines to sell papers and advertising space, or a party looking to conduct a phishing exercise to harvest more emails, then you'll say whatever misleading headlines work best. Because to do otherwise would be..you know... responsible.